That’s me in the front on the right leading the pack for half a lap. 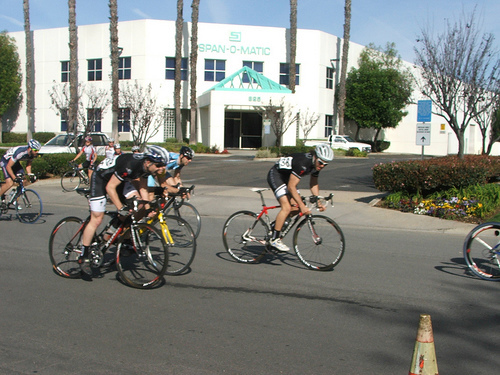 Jesse and Keith from Team Bear Claw (in the black kits) sprinting for the line. Jesse got 2nd and Keith got 3rd. Jesse, Brandy and I after the race. Thank you to all my sponsors, Cervelo and their fantastic Soloist Carbon very aero very comfortable and very stiff in a sprint, Kenda Tires for the C2C’s, Sportquest for their amazing CarboPro 1200 nutrition product, Red Star Energy for their quick pick me up energy tablets, and as always my club Team Velosport Team Sho-Air Sonace. 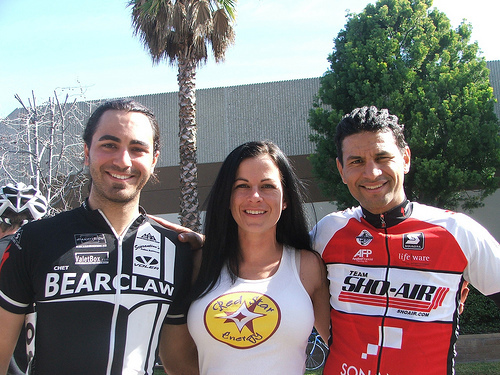 OFFICIAL RESULTS CAN BE FOUND ON THE SOUTHERN CALIFORNIA NEVADA CYCLING ASSOCIATION (SCNCA) WEBSITE. Sunday was my first ever Criterium. I am venturing into other types of racing this year to answer one main question…..”Am I good enough?” I know I am a decent Ultra Cyclist. But how will I do at short intense effort races? So this year I will be doing some Road/Crit/TT races to round out my experiences as a cyclist. I also think that it will help in my Ultras because I will pick up some intensity that I just can’t get in training. 1. As stated before am I good enough? 2. How bad will I get dropped? 3. Will there be a crash and will I be involved in it? 4. Will I posses the bike handling skills required? 5. Can I finish in the pack? 1. I think I am good enough to hang but winning a race is not in my genes! 2. I didn’t get dropped…this time. I stayed in the top 10-20 wheels the whole race. 3. There was a crash with 4 laps to go right in front of me. “Luckily”, for me I was losing contact with the rider in front of me on the slight uphill. By time he went down there was about 20 feet gap between us. As he tumbled his bike slid into my left chainstay and knocked my rear wheel off it’s line. But I regained control of the bike and continued to hammer up the slight up hill towards Turn 4. 4. I was timid in the first few laps but as the speed increased and the necessity of covering the wheel in front of me meant sitting in or getting dropped I felt more comfortable with cornering at 30 mph. BUT I know it will take many more races even years to really feel like I am good at pack riding at such high speeds. 5. I finished 11th on my first ever Crit. A lot was just luck. Avoiding the crash was huge in finishing the race. I lost about 3 places in the last 50 meters. I was out of gas. The course has a slight uphill from Turn 3 up and around Turn 4 and flattens out about 250 meters from the finish line. My legs were done — “on both sides”. My sprint was a paltry 863 Watts. 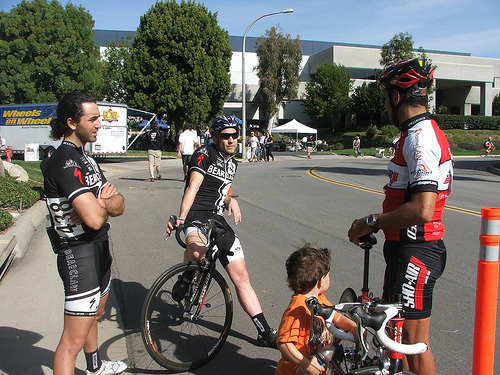 I remember on the Mullholland Double Century 200 miles and 17,000 feet of climbing (most very steep over 10% grades) and 13 hours into the event I could still hit over 1100 Watts. I paused for a second and then sprinted again and threw my bike across the line. I know you are not supposed to pause on a sprint but I was done. I missed top 10 by a wheel but hey that’s bike racing!!! Brandy had the unenviable task of watching three out of our four children, taking pictures and trying to get me ready. A huge thank you to her for supporting me in my latest adventure!! 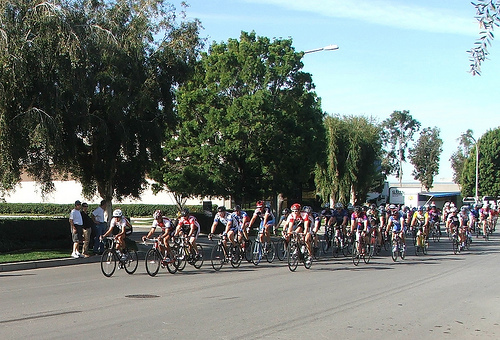 This entry was posted in Brandy, circuit races, Crits, events, race reports by REV Cycling Directeur Sportif. Bookmark the permalink.